The Unfriendly Skies: On Sunday, United Airlines forcibly removed a man who refused to part with his seat on a flight from Chicago to Louisville, reports NPR, BBC News, The New York Times and CNN. Four passengers were asked to give up their seats to make room for United employees needed for another flight in Louisville. The airline asked for volunteers, offering $400 and a hotel stay. No takers. They went up to $800. No takers. Then they announced a computer would select four customers at random to be bounced. Three of those customers disembarked. The fourth, later identified as Dr. David Dao, 69, of Elizabethtown, refused. He said he had patients in the morning and had to get back. Which is when things got messy. After some back and forth, security officers grabbed Dr. Dao, hitting his head on the armrest during the altercation. His body goes limp as they drag him down the aisle. That’s the big mystery here for me. How did a bloodied and concussed 69-year-old get away from three giant security guys and make it all the way back on the plane? 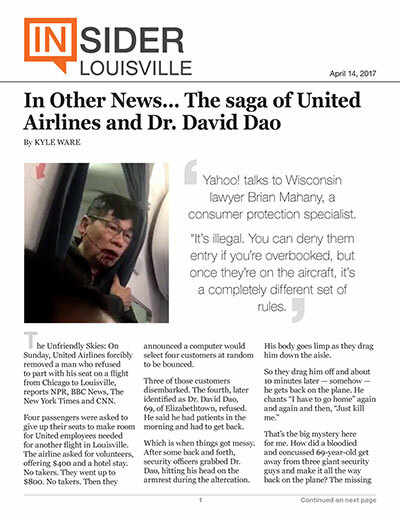 The missing 10-minutes of Dr. David Dao. He was held in Chicago for medical attention. Internet backlash was swift and immediate. Of course, the whole problem here — he had a ticket. The Chicago Tribune printed a firsthand account from Jason Powell, a teacher at Louisville’s Male High School, who was onboard flight 3411 with seven students. He says while he was appalled at how the situation was handled, he took solace in the reaction of his fellow passengers. Yahoo! talks to Wisconsin lawyer Brian Mahany, a consumer protection specialist. It gets a little more complicated here, because the flight wasn’t really overbooked so much as United wanted to add people to a plane already filled to capacity. Newsweek and INC come to similar conclusions. Then, in a move straight from “Public Relations: How to make things go from bad to downright awful in less than 24 Hours,” CEO Oscar Munoz released his own statement. By midweek, Munoz had figured it out. He appeared on ABC’s “Good Morning America” and had figured out what a human response looks like and decided to go with that instead of the corporate speak. USA Today reports all passengers on the flight that day will receive a full refund. So it was rough going for United this week. And then a couple of days later on another flight, a scorpion fell out of the overhead and stung a guy. So there’s another method to get people to give up their seats. Which is about the only thing you can do. Attendants flushed the scorpion and contacted medical professionals to care for Mr. Bell. He’s fine. I don’t know if the scorpion counts, but The Los Angeles Times says United also has the worst record for pet deaths for the last two years in a row. But you wonder what else can happen with United at this point. NBC News says Demetrio says Dao suffered a broken nose, a concussion and lost some teeth in the incident. He may require surgery. Meantime, United’s stock isn’t faring so well. Fortune says the company took a $1.4 billion tumble on Tuesday and customers continue vows to boycott the airline, though Bloomberg says the mergers of the last few years will make that almost impossible. It could also hit CEO Oscar Munoz personally. Fortune reports he could lose his $500,000 bonus.